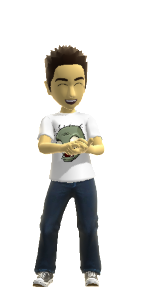 How can I get a picture of my XBox Live Avatar? I see many people with pictures of their XBox Live avatars on their websites, and I wondered how it was done. Turns out, its extremely simple. Type http://avatar.xboxlive.com/avatar/<XBox Live ID>/avatar-body.png into your browser, substituting the <XBox Live ID> for your gamertag, and you’ll have a PNG of your avatar. What if your gamer tag has a space, like mine?